Well, we have braved and conquered our first road trip. with an infant. I don't think I had that many butterflies in my stomach about something since my wedding. I seriously was SO nervous about how Brayden would do in the car; not like I had anything to validate those feelings, as he's always been a very easy baby, especially when it comes to sleep and travel, albeit small trips around town. We left Friday after I got back from the doctor's office and Brayden slept the ENTIRE WAY! 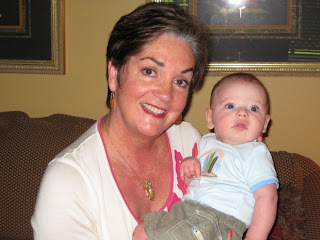 The weekend was filled with visits to see tons of friends, many of whom had never met little man. He fared incredibly well, and even slept through the night both nights! We are thankful to the Henry's for letting us crash at their place. They truly are our home away from home and like family to us! We enjoyed visiting with Steph & Justin, Court & Adam, Christy & Chris, Rebecca & Matt, and the Parkinsons, just to name a few. Plus, I saw a lot of faces I hadn't seen since high school at my friend Ruthie's wedding. It definitely was a great trip, and a great courage booster for me to brave a road trip to Baton Rouge. The plans are set for me to drive back with my sister and her boyfriend in September and stay down there for an extended visit. We're hoping Brayden continues the trend of being an awesome traveling baby! Enjoy some of the snapshots from the weekend! 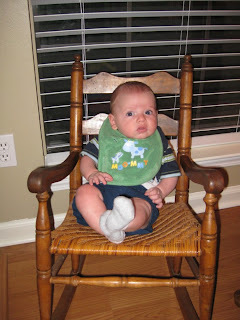 "Mommy, Daddy set me in this rocker, but I'm not sure I really like it." 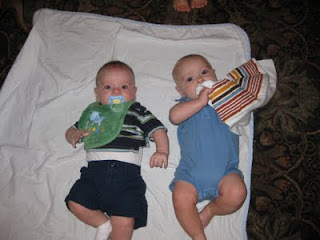 B and his new buddy Lawson-- they're only 5 weeks apart!